How Developed is Global Venture Capital Market? Just where is the US venture market relative to the rest of the world? After most US analyses I publish, a few founders in other geographies ask questions about their own. These inquiries made me wonder, how has the global market evolved? The chart above shows the compound annual growth rate of venture investment rounds A through D in ten fastest growing venture markets plus the US from 2010-2016. The USA is slowest growing market across that six year span at 12% CAGR. Meanwhile, Korea, China and Japan take the top three spots. Brazil, United Arab Emirates, and Ireland follow at four, fix and six. It’s wonderful to see the expansion of venture capital across these geographies and especially at very healthy growth rates. A 50% growth rate sustained over 6 years implies 11x growth in venture capital investment during the period. The US, meanwhile, grew 75%. 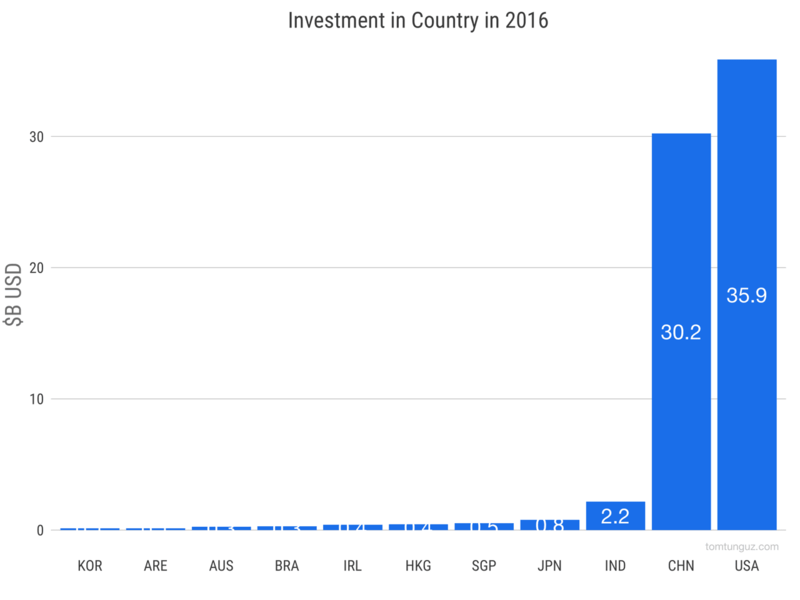 Turning to the median size of an investment, the data reveals China tops the list at $30M in round size. Ireland follows at $16.5M with the USA, Japan and Hong Kong all at $10M. The missing piece of data concerning round size is the valuation metrics. A $10M round in the US might buy 20-25% of a business. What does a $3M round buy in Brazil or a $6M round buy in India? I’m not sure. If we look at aggregate venture dollars raised in a year, two immediate, obvious and important conclusions surface. First, US and Chinese startup markets have raised an order of magnitude more capital than any other country of countries raised at these growth rates. India at $2.2B in investment is 6% of the US market. This chart illustrates the depth of the capital pool available to startups. 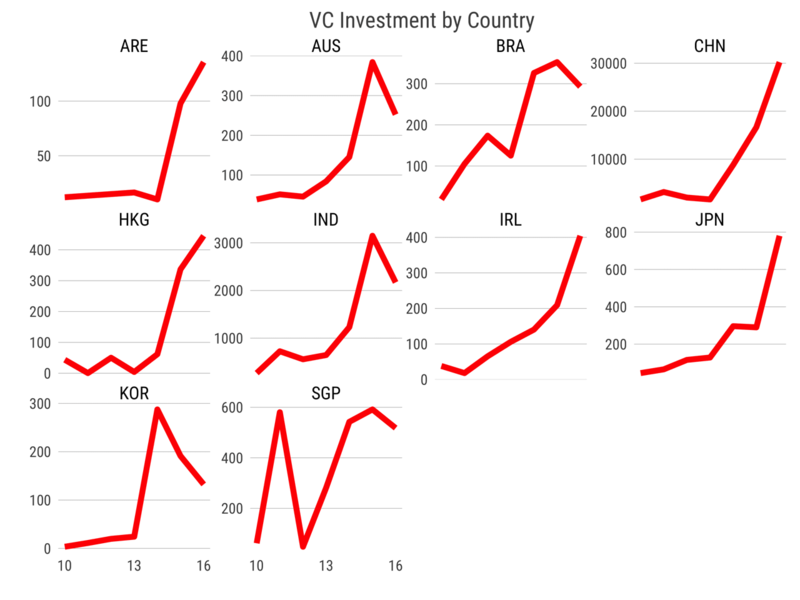 Note these charts only includes the top 10 fastest growing countries in venture investment. 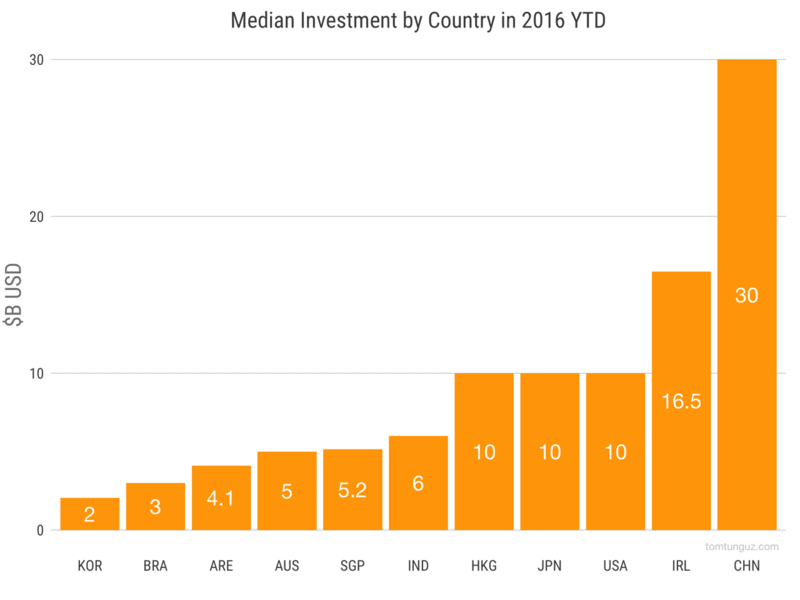 Israel, a notable exception, saw $1.1B invested in 2016, with a growth rate of 19%. Second, in 2016, Chinese venture investors invested $30B, and that amount grew 19% over 2015. Should that trend continue, in two years or sooner, the Chinese venture market will exceed the US in size. This milestone could accelerate in particular because the US market is reverting to the mean after the 2014-2015 heyday. 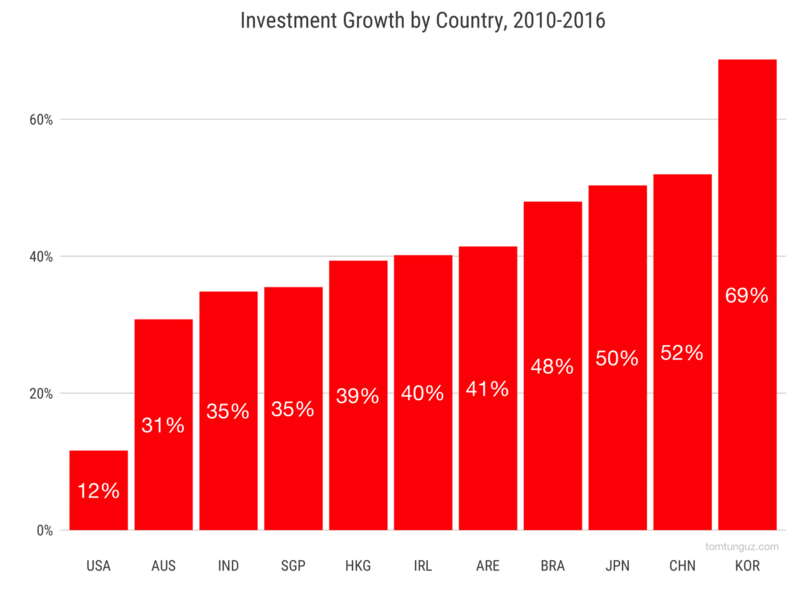 Last, the time series analysis illuminates the countries that are seeing geometric and uninhibited growth in venture capital investment: China, Hong Kong, Japan, UAE/ARE, and Ireland. Australia, Brazil, India, and Korea investing activity has mirrored the US, with a striking rise and recent fall. Meanwhile, Singapore oscillates is nearly binary, between zero and $600M invested annually. The global market for venture is growing. Outside of the US, China and India, the markets aren’t deep. But if these other geographies sustain similar growth rates to the past ten years, the startup fundraising environment will look very different than it does today.